Parted Magic – a package of utilities for working with hard drive-based bootable CD Linux. Allows you to perform various operations on partitions and supports a large number of file systems. 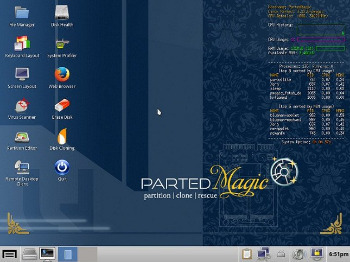 Parted Magic – partition manager based on Linux, working with the LiveCD, USB-drives or over a local network. Supported by any data operations – move, delete, restore, cloning partitions, etc. Besides, Parted Magic allows you to configure the operating system, as well as access the Internet using the included dristributiv browser Firefox. Parted Magic supports file systems ext2, ext3, ext4, fat16, fat32, hfs, hfs +, jfs, linux-swap, ntfs, reiserfs, reiser4, xfs. – Ntfsprogs – tools for working with NTFS. – nbd – network block device, client and server.